What attracts attendees to a trade show booth? Effective branding that excites both the curious passerby and the loyal customer! Branding your booth in a way that conveys your identity can be challenging, but don’t worry we’re here to help! Trade shows provide an excellent venue to increase visibility within your industry, while bolstering your identity through networking. Genuine conversations with attendees will reinforce brand recognition, solidify relationships with current customers and encourage future interactions. Related: For additional trade show design tips, check out our Design Guide! When it comes to building a brand identity, it is important to consider brand positioning, personality and promise. Brand positioning is a statement that articulates why your target audience should choose your brand to satisfy their needs rather than choosing one of your competitors. In order to successfully position your brand you need to understand your target demographic. By creating a buyer persona (a fictional representation of your ideal customer) you can figure out what motivates attendees to purchase and gain crucial behavioral insights. I mean, when it comes to using promotional material to build your brand identity, a creative way of doing this would be working with personalised umbrella companies. This isn’t something that every company does, but it will be a way of making your business stand out from the rest, especially when it comes to building relationships with clients. This may be something worth looking into. Think outside of the box. What can you do better than competition? Learning the desires, needs and concerns of your target audience is great, but you will also need to have a good understanding of your competitors, specifically the ways they meet and miss the mark with your shared customer-base. For example, certain brands can be “modern, cool and sleek” while others are “comfortable, sensible and conservative.” To self-actualize your brand’s personality, you must dig deep to determine your company’s culture, goals and desired customer base. Relationships are built on promises, and a company-client relationship is no exception. For starters, figure out what consumers rely on your company to provide. Get to the core of what your company offers beyond the physical items being sold. Promise also extends to quality, warranty and peace of mind. Customers and clients believe in your company’s values and products, be sure not to let them down. Making sure everyone on your team is committed to keeping the promises you make to your customers in order to reinforce brand loyalty. 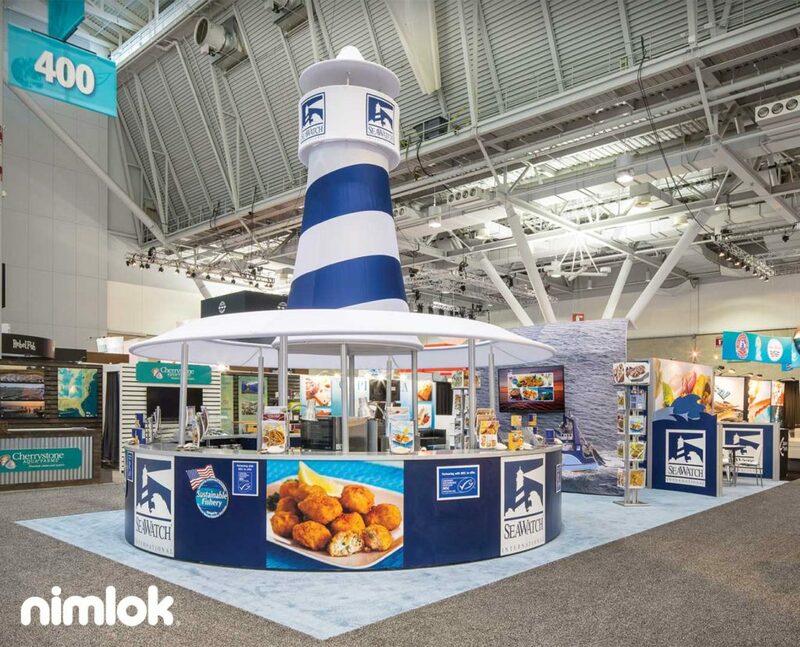 The design elements of your trade show display are key when it comes to creating a memorable “brand experience.” Wow visitors with tactful product showcases and interactive displays that introduce your brand’s personality. 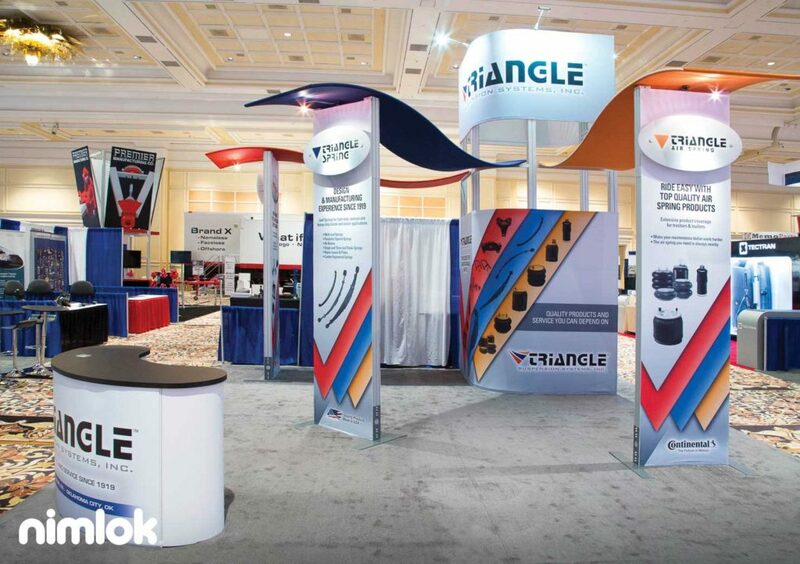 Consider these design factors as you prepare to show off your brand on the trade show floor. A large exhibit isn’t always necessary, especially if you’re new to trade shows. However, a large exhibit can set you apart as an industry leader, furthering your brand goals. Your booth size should reflect the size and scope of your company while taking into account cost versus possible return. Tactically include company logo, brand colors and significant messaging on booth graphics. Important messaging should be at eye-level so attendees can learn more about your company, but other branding elements should be visible from top, middle and bottom. Subconsciously or consciously we associate certain colors with particular characteristics. Green can mean environmentally friendly, black is luxurious and red makes people hungry. Harnessing the power of color is crucial when it comes to branding. Your booth design should use colors that align with your brand’s personality. Hanging signs are the best way to stand out in a crowd. Hanging signs are can be fully customized to suit your brand’s needs, and creatively incorporate products like Trilliant did with their instant coffee products. Also, including display lighting to illuminate products and draw attention to your logo will greatly improve your brand visibility. A brand’s foundation begins with consistent messaging and authenticity. A successful brand is created organically to inspire customer loyalty. This construction process starts with concise brand positioning, personality and promise. A strategic pre-show marketing plan will help build brand recognition, leading to an increase in booth traffic. Brand awareness is tied to visibility, as attendees will quickly identify the brands they recognize. This comes into play when selecting an exhibit that fulfills your trade show objective. A custom display with eye-catching colors, logo and lighting will stand out from the rest. When it comes to visibility, make sure your brand is immediately recognizable to passersby. If necessary, redesign your logo by using a local firm. If you’re based in Birmingham for example, then consider logo design birmingham agencies. It is a universal truth that people love free stuff. However, many exhibitors have saturated the trade show scene with swag that is tacky and practically useless. Don’t be one of them! Distributing useful and unique swag emblazoned with your logo will remind attendees of your brand long after the trade show ends. For maximum impact, promotional items should accurately represent your brand, as an unrelated item may be confusing. Put simply, staff members are your brand’s most valuable asset. They directly represent your company’s image, products and customer service. Whether you choose in-house or external staff, it is important to clearly communicate brand standards and how to effectively implement them during the show. Consistency between booth staff and brand messaging is integral part of connecting with attendees. Related: Check out our Trade Show Booth Staff post to create an all-star team! Breathing life into your brand’s identity is vital to trade show success. Understanding your company’s mission and personality will allow you to develop a marketing strategy that will extend across multiple platforms, trade shows included! Branding is an important part of the trade show planning process. 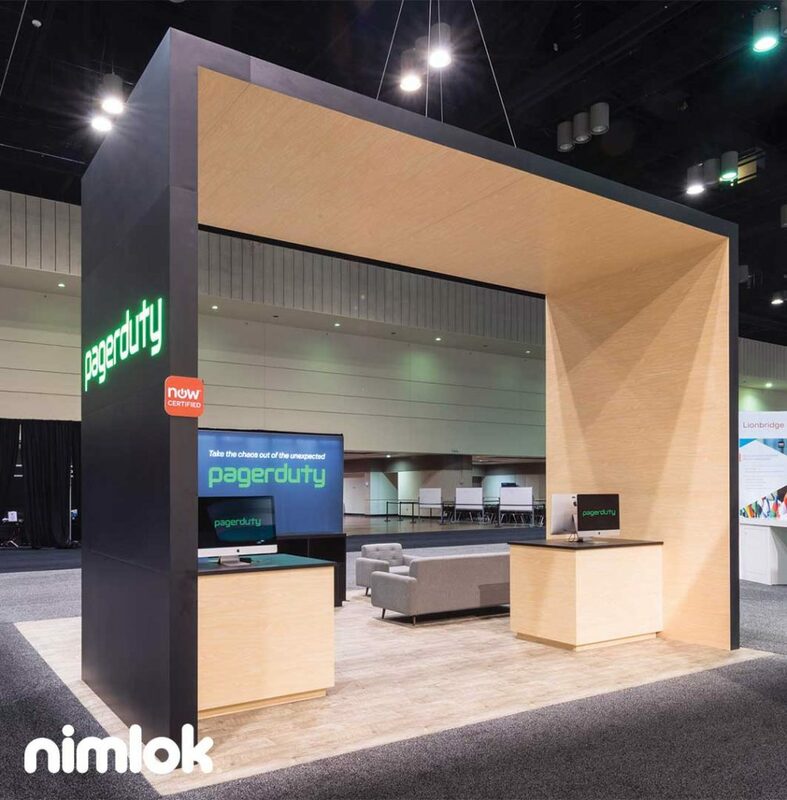 Stay ahead of deadlines with Nimlok’s Ultimate Trade Show Planning Checklist, which outlines common “to-do” items in the months leading up to and after an event. From reserving booth space to promoting your presence at the show, this checklist will help you juggle your trade show to-do list. Hi Jillian, what a fantastic post! Indeed, distributing useful and unique giveaways with your logo will remind trade show attendees of your brand long after the event. According to various studies, attention span has reduced to less than 8 seconds in recent years. Graphics play an important role for your brand at a trade show in this age of reducing attention spans. Graphic designs can persuade your customers to think about your business. A well-created brochure design, for example, has the power to give a sense of connection with a brand.